The West Broadway Street in Downtown San Diego is not the art center it sounds like it is but rather a city administrative center with attorneys and district attorneys coming and going through the high-rises and county courthouse. Situated at the intersection of West Broadway Street and India Street, Grand Central Cafe shines in its enviable corner location that opens to two animated street views. With the entrance above several stair steps, the cafe is slightly hidden, but upon entry, there is an expansive floor plan: The high ceiling, bright and lofty, might remind you of train stations like Los Angeles Union Station or New York Grand Central Terminal. Gleaming on the light-brown wooden square tables and Windsor chairs, the warm sunshine coming through the tall, round top windows unfolds the scene of the waiting room of the station. The bar at the corner has a colorful painting of a train above on the ceiling; it is commodious and relaxing as well as private. The waiters move quickly in their aprons. As soon as a customer sits down, one of them comes by and asks, “Tea or coffee?” filling the cup with the desired beverage. The menu is inspired by a subway map in which each dish represents a station, organized into categories including Basics (eggs and a protein), Daybreak Omelets, Mexicali Rose (Mexican dishes), Breakclub Bagels, Flatcar Griddle (toasts and cakes), Side Track (sides), Drinks, Fruit and Cereal and last but not the least, Caboose (wines and beers). The basics include eggs in any style and the choices for protein among crispy bacon, mild spicy sausage and other meat patties. 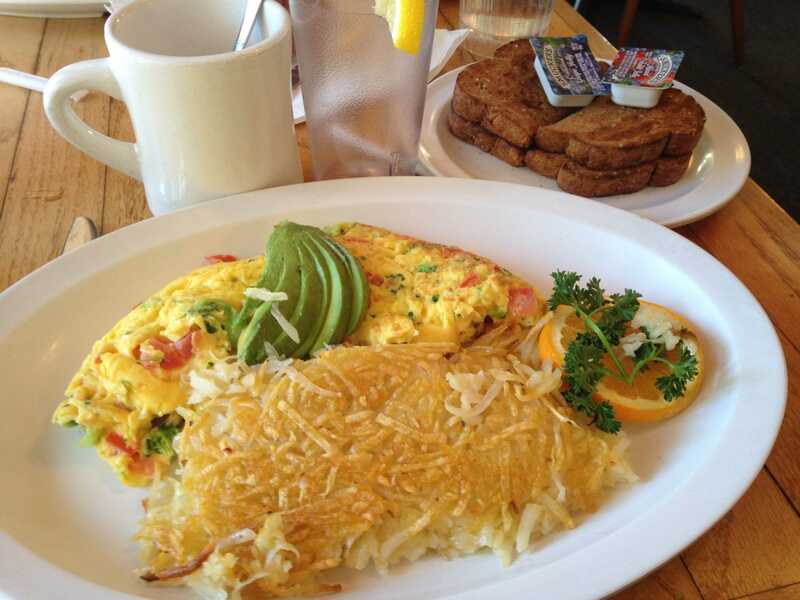 All omelets ($8.95) come in large combos at an affordable price, with two sides to choose from two categories, one from homemade country fries (hash browns), fresh tomato slices or cottage cheese, and the other from wheat, rye, white bread, sourdough, English muffin or buttermilk biscuit. The wheat bread tends to be overly greasy because of the butter; luckily the mild homemade-style omelet balances out the grease. The Garden Patch Omelet has broccoli chunks that are cooked to a refreshing texture — well-done but not too soft to compromise its freshness. The Multigrain Pancake (three pancakes for $5.95) is one of the most popular dishes and is usually spotted on several tables in the cafe. The inside-out caramel color of multigrain distinguishes it from other plain pancakes, and the mellow taste and warm, velvety texture becomes rich and silky after being dipped in butter and syrup. For people working in this district, the Grand Central Cafe is considered a convenient and quiet breakfast diner to kick-start the work day. The open interior also saves them waiting time. If you are a future law school student or an office worker, this cafe, as well as the neighborhood, is worth visiting to get a taste of the professional lifestyle. To get here from UCSD, just hop on the 150 express bus and get off at Front Street & B Street. From there, it is a ten-minute walk. The big round clock and the TV on the walls of the cafe are two things that never stop moving forward, breathing with the rhythm of this lively downtown San Diego spot.